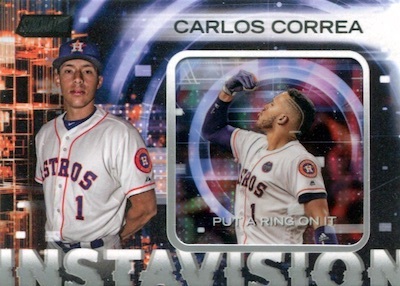 2018 Topps Stadium Club Baseball puts the players at the forefront, using fairly simple designs to highlight quality photography. Each hobby box also delivers two signed cards. 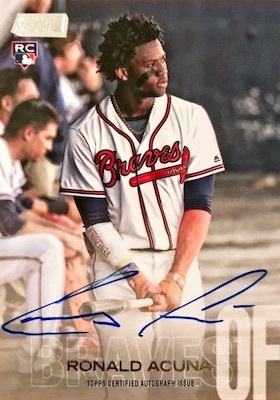 As a brand with an established past and dedicated following, Stadium Club MLB again cements its spot in the hobby rotation with impressive imagery and on-card autographs. In addition, 2018 sees a greater focus on 1990s-inspired inserts. The meat of the 2018 Topps Stadium Club Baseball checklist comes in the 300-card base set. These full-bleed cards showcase stars from across the MLB landscape, including top rookies and retired players. The main set offers parallels like Black Foil (1:8 packs), Red Foil, Rainbow Foilboard (#/25), First Day Issue (10 copies), Members Only (1 per case), and Photographer's Proof (1:2 cases). 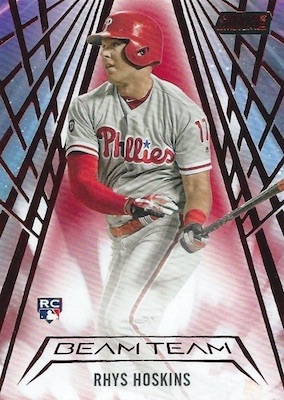 There are also hobby-only Black and White (1:48 packs) and Gold Rainbow Foilboard (1/1) parallels. Exclusive to retail, Sepia parallels come 1:8 packs. Building on their first appearance in 2017, Chrome returns to provide a chase element for 90 subjects. The main Chrome cards fall one per box, but more limited versions are also in play, including Refractor (1:4 boxes), Gold Minted (1 per case), and SuperFractor (1/1) editions, which are exclusive to Hobby boxes. A standard for the brand over the last few years, image Variation cards return for select base subjects. Mixing standard TSC sets with throwbacks from the '90s, the 2018 Stadium Club insert lineup goes deep. 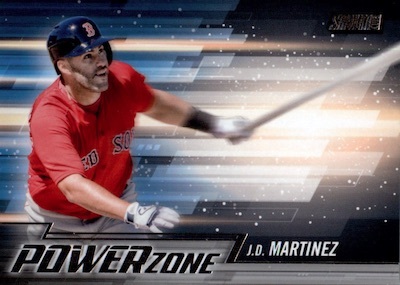 Each highlighting 25 stars, Beam Team (1 per box) and Power Zone (1:8 packs) inserts are back. These are joined by Never Compromise (1:8 packs) cards for the truly driven players, and Special Forces (1:8 packs), which features another design based on 1990s releases. Beyond the main versions, all four inserts come as Red (1 per case), Black (#/99), Orange (#/50) and Gold Rainbow (1/1) parallels. Another recurring option, case-hit Instavision utilizes Chrome Refractor technology to enhance the cards for 10 elite players. These also have Red (#/50), Black (#/25), Orange (#/10) and Gold Rainbow (1/1) parallels. While the breathtaking photos keep fans coming back, the signed cards—falling two box—remain a big draw for 2018 Topps Stadium Club Baseball. This includes the on-card Base Autograph set, with Red Foil (#/50), Black Foil (#/25), Rainbow Foil (#/10; Hobby only), Orange Foil (#/5; Retail only) and Gold Rainbow (1/1; Hobby only) parallels. 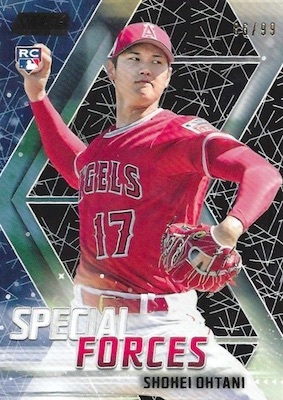 Likely to be a popular pull, 2018 rookie Shohei Ohtani is one of the teased signers from the sell sheet. Taking that up to two hard-signed autographs per card is Co-Signers (#/10 or less). The one-of-one Gold Rainbow (1/1) edition is the sole parallel. Expanding the chromium appeal, the Chrome Autograph cards cover select players from the base Chrome set with print runs of 10 or less. 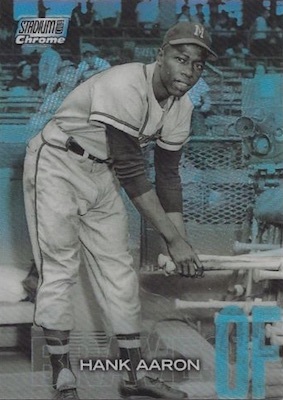 These have rare SuperFractor (1/1) cards to dream about, as well. In addition, Lone Star Signatures still holds a spot in the 2018 Topps Stadium Club Baseball checklist. Finally, there are autographed versions of the Beam Team, Power Zone and Never Compromise inserts. All four of these lines offer Orange (#/5) and hobby-only Gold Rainbow Foil (1/1) parallels. 300 cards. Shop complete base sets on eBay. PARALLEL CARDS: Red Foil (1:3), Black Foil (1:8), Sepia (1:8; Retail only), Black/White (1:48; Hobby only), Rainbow Foilboard #/25, First Day Issue (10 copies), Member's Only (1 per case), Photographer's Proof (1:2 cases), Gold Rainbow Foilboard 1/1 (Hobby only). 90 cards. 1 per box. PARALLEL CARDS: Refractor (1:4 boxes), Gold Minted (1 per case), SuperFractor 1/1 (Hobby only). 93 cards. 1:10 packs. Shop autographs on eBay. FOIL PARALLELS: Red #/50, Black, #/25, Rainbow #/10 (Hobby only), Orange #/5 (Retail only), Gold Rainbow 1/1 (Hobby only). 76 cards. Serial numbered #/10. 1:800 packs. 25 cards. 1 per box. PARALLEL CARDS: Red (1 per case), Black #/99, Orange #/50, Gold Rainbow 1/1. PARALLEL CARDS: Orange #/5, Gold Rainbow 1/1 (Hobby only). 11 cards. Serial numbered #/10 or less. 1:5,778 packs. PARALLEL CARDS: Orange #/5, Gold Rainbow Foil 1/1 (Hobby only). PARALLEL CARDS: Red #/50, Black #/25, Orange #/10, Gold Rainbow 1/1. See the 2018 Topps Stadium Club Baseball checklist spreadsheet. I know the thing that sets Stadium Club apart from the rest of the field is the photography, not the card design itself but the name plates are awful and clutter the photograph with these layers of text…maybe they’ll look different in hand but not a good start for Topps. Disappointing. Always my most favorite release of the year! Yes let us kick off some current laying mlb players and let retired players take their place. I think that once a player retires they do not need to be put on a base card. They can be put on a sp card but not a base. Putting retired players on cards is how you get rookie cards of players after they have been in the league for a few years. The name and teem name are very very difficult to read. This is a terrible design. Love the look of them. The faded text is nice as is allows the image to take over the card more. Ordered a box. Agree of less retired players and replace with active players and rookies. Overall very well done. I always enjoyed legends such as Ruth, Feller, Cobb in a black and white photo that was unique to Stadium Club. This year, they eliminated these legends with a terrible design. Topps lost a customer this year! As with most sets – FEW TIGERS – 4 base – Only good thing is RC Auto. But odd of pulling that 00000. Cheaper to get on ebay. Even Box breaks not good this year. who is ready for stadium club ???? 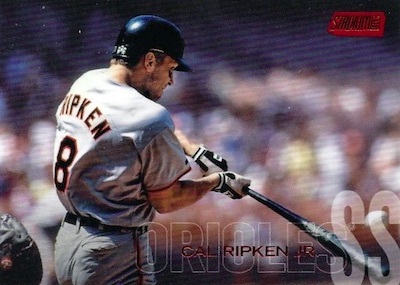 Nice photography, but why does Topps hire people who know zero about typography? 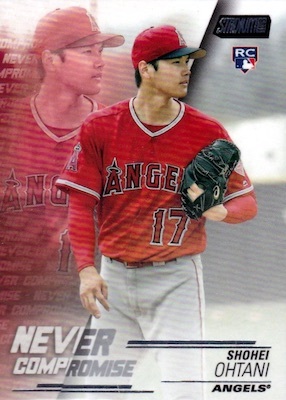 I cannot read a black word against a dark background, and almost every card has unreadable names and/or teams in this product, year after year. Attention, Topps: Dark on dark does not work. Do you know the meaning of the word “contrast”? You need to hire real artists who understand typography. Inserts look great this year! Overall nice price for what it is but still no Eric Davis Topps what’s going on!!! Price is lower but the chance to get good hit is lower too. Lower cost to get complete base set.It is good for me.Because I love photo in this product. Great photos and good checklist. Great price. I like the older players in the set. Good collation, I was able to get a set out of 4 boxes. Got 2 case hits in my boxes, Trout Instavision, and Schwarber Gold Minted and a Black Hoskins Beam Team. B O R I N G this is the most uncreative series I think I’ve seen since the 80’s to come from topps. I grabbed two blasters at WM today and opened with my son. Box 1 (dad): Ohtani “Special Forces” black /99; Box 2 (boy): Mariano Rivera GOLD chrome refractor. Pretty good for two blasters…I had better luck with Heritage blasters this year–can’t help but wonder if Topps is strengthening the retail products a bit as more hobby shops go the way of the magic cards. The gold chromes are listed as 1 per case, but I assumed that meant hobby case–I guess any case is a possibility. I do like this year’s design a bit more than some previous ones. Not a real lover of baseball but did buy a few packs today and pulled a Judge & Jeter co-signers gold rainbow 1/1 auto. Might be stupid questions but how to you tell if the chrome is a refractor or just base chrome?? For Chrome Refractor parallels, the word Refractor is printed under the card number on the back. Beautiful product but can we please take it easy on the garbage autos? I’ve participated in 3 different case breaks and there are some really weak cards on this checklist. There are some really nice cards but they’re so rare it’s almost not worth the money. High-quality, creative Topps photography at its best!! Captures the game! Love the photography! Autos (at least the ones I got) were meh at best in the 2 hobby boxes. Did get a Dustin Fowler auto /25, we’ll see how he pans out. Also bought a single pack from the same hobby shop and pulled a gold rainbow 1/1 (too bad it wasn’t auto’d). Overall, nice set but decent autos are hard to come by. Can anyone tell me if autos with different color ink means anything with this collection? I noticed all my autos have been in blue ink, although I noticed I just opened another auto for a player I already have but this time the auto is in red ink and not blue like the other one I own for the same player. I’ve only seen Mejia with red ink versions. There was no mention if they are intended to be rare short prints or he just lost his blue pen at some point in the signing, but the red ink does appear to be slightly less common. Thank you, and it was a Mejia with the red ink. Since I never saw anything else, I thought he just grabbed a new pen as well. Trey, I pulled a Cameron Maybin Members Only in a retail pack recently. I’ve read they are 1 per case. Is there any indication of a print run of these, being that they are rare?? Thanks for your help sir. Based on the odds, the Member’s Only cards are more common than the First Day, which reportedly has 10 copies, and less common than the Rainbow Foil, which is numbered to 25. So, the print run is likely somewhere between 10 and 25 copies, probably around 15-20 per card. Opened 3 boxes @ $60 a box. They were clearing space for 2019 product. I didn’t do great :) For the autos I got 2 of the same in Andrew Stevenson, 1 of each Locastro, Urena, Arano, Pham and Strawberry. Did get a Red Beam Team in the way of Judge. Overall, not great. Lots of duplicates also. No where near completing a set even after getting 3 boxes. 2018 Topps Stadium Club Baseball Factory Sealed Hobby Box - 2 AUTOS!